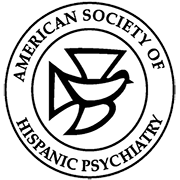 The American Society for Hispanic Psychiatry fosters multidisciplinary collaborations in mental health treatment with a particular focus on Latino Populations. Members are practicing psychiatrists, psychologists, and other mental health workers. It is essential to our growth and success that we maintain a broad based membership and it is essential to have the support of the academic research community to continue to provide opportunities for continuing education for psychiatrists all over the United States, Latin America and the Caribbean. Nancy Catherine Colimon-Ardila, MD was born in Bogota, Dr. Colimon-Ardila completed her Medical Degree and her post graduate training in Psychiatry at the Universidad Nacional de Colombia. She also completed a fellowship in Neuropsychiatry at the University of Illinois at Chicago. She is a former voluntary faculty member at Universidad Pontificia Javeriana and the Universidad Nacional de Colombia. She is a past president for the Colombian Society of Biological Psychiatry. She is currently the Medical Director for Renovarse Geriatric Center in Colombia, and Innovation and Operations Director for Nuevo Atardecer Geriatric Center in Mexico. She is also founder and director of Unir Pais a non-profit organization that promotes mental health prevention in rural areas of Colombia. Dr. Colon-Rivera grew up between San Juan and Vieques, Puerto Rico. His mother, a special education teacher often took him to work with her, where he was exposed to families dealing with mental illness. This early exposure instilled in him a deep understanding of social factors, such as poverty, lack of education, poor accessibility to health care, as well as poor social and family support contributing to mental illness. Following medical school in Puerto Rico and his psychiatric residency training at Boston University, he completed an addiction psychiatry fellowship at Yale University where he focused on working with adults and adolescents with substance use disorders. He is a current faculty member at the University of Pennsylvania and the Philadelphia VA Medical Center where he specializes in the acute care of patients with a wide variety of mental health and substance use disorders. He is an attending physician at the University of Pittsburg Medical Center (UPMC) working on an emerging community program to increase rural access to Medical Assisted Treatments for patients with substance use disorder. Pamela Montano Arteaga, MD is Clinical Assistant Professor at NYU. She works as a psychiatrist and Director of Latino Bicultural Clinic at Gouvernuer Health. She completed her Psychiatry Residency at Northwell Hofstra School of Medicine at Zucker Hillside Hospital and a fellowship in Public Psychiatry at Columbia University. She was born and raised in Colombia. Dr. Montano completed her medical school training at Universidad del Valle in Cali (CO). As an APA Minority Fellow (2014-2016), she participated in the Council on Minority Mental Health and Health Disparities. She is currently the co-Chair of the APA workgroup trying to develop a toolkit to guide providers treating undocumented immigrant population. She is one of the recipients of the 2018 Young Physicians of the Year Awards given by the National Hispanic Medical Association due to her contribution to Hispanic Health through her work at NHMA and different advocacy organizations. She also recently started working on program of Integrated Care with the Obgyn Department at her work site and she also will be a provider for the Empower Program that works victims of Human Trafficking. Maria de las Mercedes Perez-Rodriguez, M.D.